Team Stegosaurus won the 3rd Annual J-School Hackathon. From left are Mark Glaser, Reann Huber, Alexander Villegas, Claudia Luna Priego, Brianna Spause, Ahn Nguyen and team facilitator Hannah Wang. Photo by Mark E. Johnson. Here’s the question we tried to answer: Can journalism and communications schools help shape the next generation of media entrepreneurs? 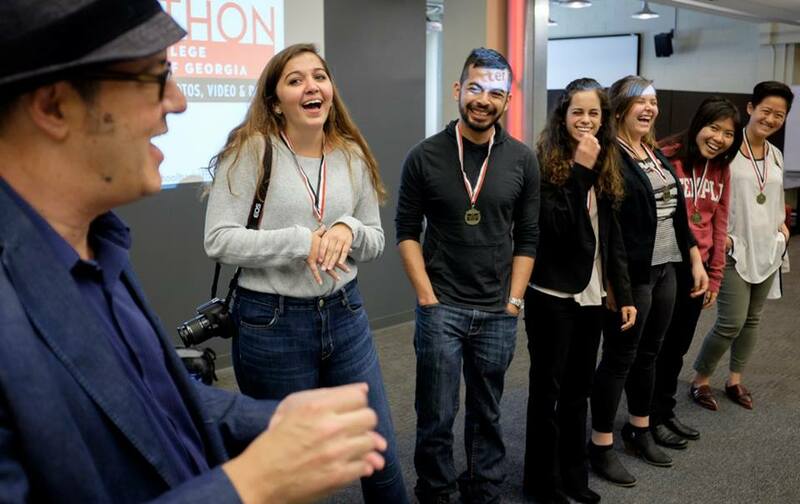 Along with the Henry W. Grady College of Journalism and Mass Communication, MediaShift produced its third annual Journalism School Hackathon from Oct. 21 to Oct. 23 in Athens, Ga. The event, focused on fact-checking and verification, allowed participants to create startups in one of four threads: social media, photos, video or data. The winner of the Hackathon was a group of students who pitched Veridex, an app that verifies user-generated content.